Background: Diabetes Mellitus is a disease of public health significance in the world and especially the African region. Aim: To assess the myths and misconceptions about DM among patients with DM who are attending a teaching hospital. 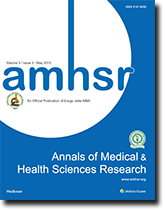 Methods: This study involved adults diagnosed of type-2 diabetes who were consecutively recruited from the LAUTECH teaching hospital Diabetic Clinic, Ogbomoso, Nigeria. A validated questionnaire was used to collect data about sociodemographic data, and questions about aetiology of diabetes, diets, treatment/management and Insulin therapy. All data were entered and analyzed using SPPS. P–value less than 0.05 were considered as statistically significant. Results: 101 subjects with a mean age of 60.61 ± 12.53 years were enrolled for the study. 61% were females, 76% were retirees and 58% were in the 61–80 years age group. The commonest misconception was that “diabetic patients needed a ‘special diabetic diet’” – 89.1%, followed by “adding sugar to food is prohibited” – 73.3%. 51.5% have adequate knowledge of the diabetes mellitus. Patients receiving oral hypoglycemic agents have good knowledge of the disease. Conclusion: A large of Nigerians has various myths and misconceptions about diabetes. Comprehensive health educational programs for Nigerian patients with diabetes must include sessions to identify and address the presence of these prevailing myths and misconceptions.